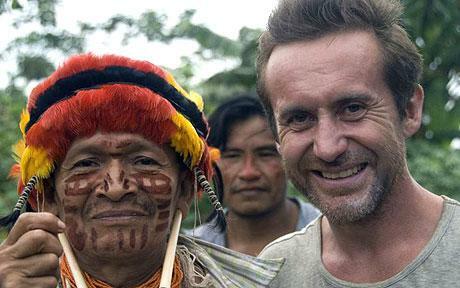 Tribe returns to our screens this week, as Bruce Parry heads off into the wilderness to spend time with cultures on the outer edges of civilisation. There’s something of a brouhaha (some say hullabaloo) going on in Britain over the annual Dhs1,000 licence fee that TV owners are required to pay, and what the BBC is spending this money on. The BBC’s Newsnight host Jeremy Paxman said recently that charging it may become ‘indefensible’ and bemoaned the falling quality at the network that employs him. To an extent, he’s right, as further cuts to the current affairs budget are indeed indefensible, but among ridiculous wastes of money like hugely expensive re-branding, anything with ‘celebrity’ in the title, the decision to pay presenter Jonathan Ross Dhs130million a year and the talkshow Kilroy, there are real gems; truly wonderful television programmes like Tribe. I wonder if he remembered saying that while curled up in a ball, sobbing and mumbling after ingesting a powerful hallucinogen as part of a rebirthing experience with the Babongo people in Gabon. Or while having his skin slashed with razor blades and thorns as part of a ritual with the Suri in Ethiopia. But no matter, he mucks in and seems to enjoy being part of wildly different cultures. There are a few moments when you get the feeling that it could take a turn for the worse and turn into a cross between the end of Apocalypse Now and Cannibal Holocaust. After watching the first few episodes, I half expected the screen to fade to black at the end and a solemn voiceover to announce: ‘Following the making of this film Bruce Parry was killed after the tribe decided he was getting a bit too friendly’. And it’s not beyond the realms of possibility that he could have been in danger on several occasions – not least when he went hunting for crocodiles at night or spent time with the Kombai tribe of West Papua who are actually cannibals. But his disarming nature seems to get through to these people in a way that makes conversation a wordless practice full of gestures and smiles. There are scenes where the locals are gathered laughing at him as he takes part in one of their rituals that is clearly causing him pain. indistinguishable from magic’, and it would be effortless to turn up to some remote tribe with a Nintendo Gameboy Colour and let the natives gawp in awe at the fat little plumber who’s running about, eating mushrooms, in this grey magic box. But that’s not Bruce’s style. Every bit of care and attention was paid to ensure that his presence didn’t adversely affect the local tribes and while he stayed with them, the two-man crew slept elsewhere. It’s the perfect blend of sociological nature programme and light entertainment. While BBC rival ITV is flying out D-list celebrities into a jungle and trying to get them to mate in front of the camera (I’m A Celebrity Get Me Out Of Here) this is the real deal. It’s on at midnight, which is a piece of bewilderingly daft scheduling, but it’s well worth staying up for and another little reminder that the BBC can still produce engaging television of true quality.